Adam Hinshelwood has promised Worthing Football Club supporters his squad won’t be resting on their laurels in the final six games of the season. Worthing put in a battling performance as they picked up a 0-0 Bostik League Premier Division draw at Kingstonian on Monday – taking them to 46 points for the campaign so far. With just one team facing relegation this season, Worthing’s Bostik League Premier Division status is all but secured. A run of three wins from their previous six league matches has seen them rise to 15th in the table – now just six points off a spot in the top half – and Hinshelwood revealed an in-house points target had been set. Skipper Darren Budd returned from injury – playing the full 90 minutes at Kingstonian – while defender Aarran Racine made his first start for the club in the draw. Anesu Sisimayi, Joel Colbran, Ben Pope, Jared Rance and Danny Barker were all on the bench against Kingstonian, with Hinshelwood delighted by his squad depth at present. “Competition for places is really high and I think that is a good thing,” Hinshelwood said. “I’ve got a really strong competitive squad, with everyone wanting to earn their right to start matches. “We’ve got an in-house points target for the end of the season – we won’t be letting the season fizzle out. Worthing have taken 11 points from six matches so far in March, with a final game this month to come at Margate on Saturday. 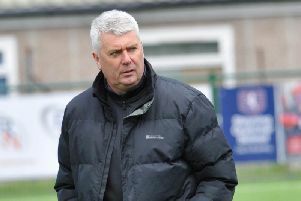 Hinshelwood has seen his team beat Billericay Town and Tonbridge Angels, while collecting a draw at Staines Town – all teams currently in the top-ten – during what has been a fruitful month so far. “We’ve had some really good results this month. When you consider the teams we’ve faced, it has been impressive. “The aim is to continue the form we’ve shown for the remaining matches this season. Worthing were boosted by the return of captain Budd earlier in the week, while injured duo Ross Edwards and Alex Parsons are close to match fitness as well. Hinshelwood added: “Having Darren (Budd) back at Kingstonian added that little bit of experience I felt we were missing earlier in the month when we played Dulwich Hamlet. “Alex (Parsons) is not far away and should get some minutes over the Easter weekend. Worthing are at play-off hopefuls Margate on Saturday, then welcome Merstham to Woodside Road on Easter Monday.